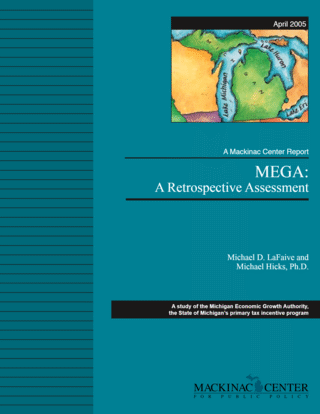 In order to evaluate the impact of MEGA credits on employment, income and unemployment rates we constructed a time series cross sectional model of Michigan's economy. We obtained data on MEGA credits by county, standard industrial classification, firm, date of approval, project start date and the period over which the credits would be applied. Data on aggregate employment and incomes were collected from the Bureau of Labor Statistics, Regional Economic Information System. These data are readily available from 1969 through 2003. We report the 1990-2003 results as this is the time immediately prior to and during the MEGA credit period. εt, the error term where we assume εt → iid N(0,σ). This panel model was estimated using both ordinary least squares and a two stage least squares instrumental variable approach. The instrumental variables included the lagged dependent variables and an instrument representing the date the MEGA project was approved (there is much variation, but a two year lag from the start date of the project is common). This approach exploits the potential endogeneity of entry decisions with the error term. This is almost identical to a technique employed in a similar context by Basker (2005) in his estimate of the impact of Wal-Mart on retail productivity. The use of lagged independent variables as the remaining instruments is a common application in panel models to account for potential endogeneity. This is especially of concern with the MEGA credit project start date and the contemporaneous spatial autocorrelation value. Also, a common presence dummy for the creation of the MEGA credit program is employed as an instrument, as is county population which will be discussed further within the context of spatial considerations. The choice of the labor force participation rate as an explanatory variable was motivated by the structure of Michigan¡¯s labor market in the late 1990s through the present. Since the decline in employment has not been met by a similarly large increase in the unemployment rate, workers are clearly leaving the labor force. Much of this is likely due to early retirement of an aging manufacturing labor force. By including the labor force participation rate for each county, we are attempting to capture potential growth in the labor force that might occur if a new plant were to open. As noted previously, the economic variables were collected from the Regional Economic Information System. The 2000 change from SIC to NAICS codes had only modest impacts on the industries we examined (which were targeted by the MEGA credits and include manufacturing, construction and wholesale). The front office operations and high technology jobs for which MEGA credits were available were a too amorphous definition to model econometrically, and were also subject to considerable variation in the SIC to NAICS change. The recession dates were drawn from the National Bureau of Economic Research national recession series. The MEGA values take several potential forms to represent the potential variability in the credit form. In addition to a dummy variable for the year in which the product was approved, there is a dummy for the start date of the project. Where multiple projects occurred in the same year, in the same county this is treated as the sum of the project starts (a count variable). One series in which the full value of the MEGA credit was entered for the year the project began. Another weighted the credits equally over the proposed lifespan of the project, and yet another presence variable for the presence of any MEGA credit in a county in a given year. For tests on individual sectors of the economy, we employ data only for those sectors (e.g. when testing MEGA credit impacts on manufacturing, we only use data on credits to manufacturing firms as reported by the Michigan Economic Growth Authority). Also, as noted in the model equation, lags of these variables are also employed. All data are obtained directly from records provided to the Mackinac Center for Public Policy by the MEDC or its predecessor agency. In this way we attempt to capture each possible scenario in which impacts may influence employment or income in each county. The data and variable description offered above provides a number of potential final model specifications. The heterogeneity of the projects themselves, as well as an absence of a clear indication of the timing of the desired economic impacts suggests that multiple tests will be necessary to draw robust conclusions regarding the impact of the MEGA credits. Finally, a discussion of the role and composition of the spatial autocorrelation is warranted. For several decades economic analysts have included a correction for time autocorrelation in models which include time series. This is because the value of most economic variables will be highly correlated with past values of itself. For example, population in any city in 2002 will be highly correlated with its population in 2001. This characteristic of time series data suggests that the error term will be correlated with the date of the observation and the assumptions which underlie the statistical models employed in this type of analysis will not be correct. This is the prime purpose for the inclusion of an autoregressive term in the model. More recently, considerations of geography have revealed a similar problem in models which treat data series that experience correlation in space. For example, the population in a given county may be highly correlated with population in an adjoining county. This is known as spatial autocorrelation. The presence of spatial autocorrelation generates the same deviation of statistical assumptions as does the more familiar time autocorrelation. Thus, the researcher must correct for the influence of space with a spatial autoregressive term. Detailed explanations of this are contained in Haining (1990) and Anselin (1998; 2001). In addition to a contemporaneous spatial autoregressive term, several researchers have employed a time-space recursive (or lagged) spatial autoregressive term. Typically the lag choice coincides with the lags employed in the time autoregressive term. Economic applications of this appear in Hicks and Wilburn (2001) and Hicks (2004). The construct of the spatial autoregressive variable is performed by constructing a spatial weight matrix W known as the first order contiguity matrix. The values of the first order contiguity matrix in this type of application may typically be considered as the mean of the value of the dependent variable in the adjoining counties (see Haining, 1990, pg 343-344 for a discussion). However, the determinant D will not share equal trace variances if there are scale differences in the dependent variable. This problem arises due to size differences across counties. To correct this we use population as an instrumental variable. Thus, the instrument choice we have undertaken imposes four specific restrictions on the model. First, the addition of the lagged independent variables in the instrument specification is designed to counter endogeneity concerns (the greatest being with the contemporaneous spatial autoregressive component). Second, the inclusion of the population instrument is designed to account for the magnitude variance in the trace of the error matrix generated by size differences in the geographic regions under consideration. Third, the MEGA credit instrument is designed to account for the possibility of endogeneity between gross firm entrance data (a variable that is not available) and the enactment of the MEGA credit legislation. Finally, the use of the MEGA credit approval date dummy is designed to remedy the possibility that a decision to approve a MEGA credit in a particular county is correlated with the dependent variable (and hence the resulting error estimate) at the time of the approval. The lagged independent, population and policy instruments are commonly employed in these types of models. The final instrument (MEGA credit approval dummy) is almost identical to the use of the entrance announcement data instrument by Basker (2005). The model proved sufficiently flexible to accommodate the data that we have available. The state of the data provides for a limited analysis. The MEGA credits provide data on all the firms which have been offered the credits. However, this data suffers important matching challenges that eliminate the evaluation of high technology firms and offices that are eligible for MEGA credits. This allows us to test aggregate incomes, employment and unemployment rate impacts and three sectors potentially impacted by MEGA ¡ª manufacturing, wholesale and construction. At the outset of the analysis we were confronted by a number of alternative variables for the MEGA credits and two for the recession. We quickly determined the broader definition of the recession better fit the data. After some analysis we were able to determine that among our many definitions of the MEGA credits, the real dollar value of the total credit in the start year was the most appropriate. Thus, we were able to test the total and part-time employment, incomes, unemployment rate for each county. Also, we could test employment and average wages for manufacturing, wholesale and construction. The results appear in Graphic A1. Interpretation of these results offers a modest range of potential outcomes. First, the model appears to perform well, with both the ordinary least squares and two stage least squares estimates appearing to suffer from little autocorrelation and considerable explanatory value. The importance of regional labor markets is clear in the high level of spatial autocorrelation, which is remarkably strong for both income and employment. As in much of the country, trends tended to matter more than recessionary periods in explaining county level labor market and income variables. This was particularly true in the recessions which occurred between 1990 and 2002. Remarkably, the impact of MEGA credits is unambiguously nonpositive. Estimates of the impacts range from zero (the most common result) in county level changes to per capita income, employment and the unemployment rate to modestly negative. The results clearly and strongly suggest that, as a charitable interpretation, in aggregate, the MEGA credits have been unsuccessful in generating growth in per capita income, employment and beneficial changes to the unemployment rate. It is this finding that should determine an estimate of the overall effectiveness of the MEGA credits. Two points of clarification are necessary. One potential criticism of these results is that while the data only captures impacts through 2002, the local impacts may require a much longer period to materialize. While it is true that the impact lags may be large, even the MEGA credits implemented in 1995 have failed to generate net positive impacts on county level employment or incomes. So, any lag impact is at least 7 years. A second impact is that MEGA credits were implemented in a period of challenging economic climes in Michigan and have continued through a recession. This, some observers will note, means that the impact of the MEGA credits may have prevented a worsening of local conditions. However, if this were the case the considerable proportion of Michigan counties that did not benefit from the MEGA credits should have suffered more, and this is not the case. The evidence clearly suggests no benefit to a Michigan county from having received a MEGA credit. Though aggregate positive benefits have not materialized as a result of MEGA credits, the possibility exists that a shift of sectoral activity has occurred as a result of MEGA credits. Thus, the disaggregate impacts matter in determining the overall efficacy of the program, but the sectoral impacts also matter. Graphic A2 describes the employment impacts and Graphic A3 the wage impacts. While the aggregate results clearly suggest no net impacts of the MEGA credits on incomes, employment or the unemployment rates, the sectoral estimates suggest that there has indeed been some adjustment within county economies resulting from the MEGA credits. The employment impacts of the MEGA credits are confined to the construction industry. Though the construction industry is not a direct recipient of MEGA credits, apparently sufficient construction is ensuing from the MEGA credits to generate employment increases in the construction sector within counties enjoying the credit. The impact is sufficiently large to generate some concern regarding the efficacy of this policy. The magnitude of the impact suggests that roughly $123,000 in MEGA credits will create one new construction industry job. These jobs are transient, with the impacts not persisting over one year. Indeed, in order to test the persistence effect of construction jobs we lagged the MEGA credit value one year. In this specification, roughly 75 percent of the jobs created by the MEGA credit disappeared in the year subsequent to the start of the project, with the remaining quarter of the construction jobs being eliminated in the second year following the start of the project. This is consistent with most findings of construction employment dynamics. MEGA credits account for no other sectoral employment impacts. However, certain other features of these models may be employed to estimate the importance of other factors in causing economic growth in Michigan counties. First, spatial interactions play an important role in county level employment in construction, manufacturing and wholesale trade. Also, higher labor force participation rates lead to higher levels of construction and manufacturing employment, but there is not a certain impact on wholesale trade employment. Clear trends in construction and manufacturing are also apparent, with both industries suffering a continuing sectoral decline. Wholesale trade employment is increasing over the period we examine (1990 through 2002). Also, as has almost universally been found, the level of employment in a county is highly correlated with earlier periods in the same county. The wage impacts attributable to the MEGA credits appear to range from zero to modestly negative. Given the weakness of the results, only the construction and manufacturing impacts should be interpreted as statistically significant. However the magnitudes of all these MEGA induced wage impacts is so small as to be without economic meaning. For example, the largest wage decline associated with MEGA credits is in the construction industry second Stage Least Squares (2SLS) estimate. This parameter suggests that for each $1,000,000 MEGA credit, the average construction worker will see his total annual wages drop by less than a quarter. This magnitude suggests a meaningless economic interpretation. Recessions reduce wages suggesting that some of the cyclical employment stability observed in the estimates above is offset by reduced wages. This is likely the result of a reduction in hours worked (a common business cycle result). A trend for lower real wages in construction is also apparent, but a more cautious interpretation of the data is warranted in the manufacturing and wholesale industries. As with the other estimates, spatial and time correlation explain much of the variability in the data. Generally, these results offer one additional consideration. The 2SLS estimates should uniformly be considered as more appropriate than the Ordinary Least Squares estimates, which are presented here for comparison. The empirical analysis of MEGA credits from their inception through 2002 suggests no net benefit accruing to the counties in which the projects were located. Indeed, the sole impact of MEGA credits estimated in this effort was a transient increase in construction employment. This occurred at a cost of just over $123,000 per construction job. Viewed through the prism of a benefit-cost analysis, the MEGA credit program is likely to fall below a reasonable threshold of efficacy. These were coded in two forms to adopt the quarterly series to the annual data employed in this study. The first form counted as a recession year any year in which any quarter was determined as a national recession. The second form included as recession years only those in which two or more quarters were recessionary. The construction of a first order continguity matrix for most states is a straightforward process. The presence of Michigan¡¯s upper peninsula posed a minor problem in that several counties are formally adjacent, but do not enjoy significant commercial interaction which is the root of the spatial influences. To treat this, only three counties are coded with borders on lakes as contiguous (Mackinac, Emmet and Cheboygan). Maining (1990) notes the commonness of this problem, which is not often corrected. Manufacturing firms and warehousing were eligible for the credits while construction will have accompanied many of the projects (though construction firms do not receive the credits directly). The alternative measures (predicted share of credits for each year, etc.) performed similarly, and in no situation did the alternative measures predict statistically significant outcomes different from the one we employ. As a technical aside, the possibility exists that the MEGA credits were targeted to poorer places (despite that not being a formal criterion). The instrumental variable approach was specifically designed to account for this possibility. Even the interpretation of construction job growth should be done with caution, as the 2SLS estimate does not enjoy typical levels of statistical significance. The $123,000 is only the cost of the tax credit. There would be additional costs involved in providing the credit, including the fully allocated cost of MEGA staff and of the business recipients.